Should IT do a Windows 10 in-place upgrade or a clean install? An important decision along the trail to Windows 10 is whether to perform an in-place upgrade or to go with a clean install. A Windows 10 in-place upgrade has the benefit of transferring a user's apps, settings, files and preferences to the new OS. Other than the new interface and features, it's a pretty seamless transition. It does not require any special installation media. The Windows 10 in-place upgrade just runs through Windows Update or Windows Update Assistant. 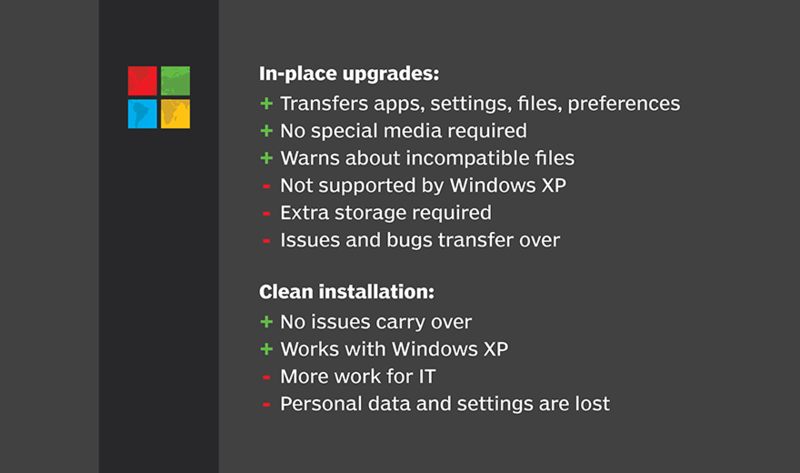 If any apps or files are not compatible with Windows 10, the upgrade warns IT what it might lose during the migration. In-place upgrades aren't always an option, however. Microsoft does not support an in-place upgrade when moving from Windows XP. In addition, the device being upgraded to Windows 10 must have storage capacity available for all the existing files, as well as the new OS. The other limitation to bear in mind is that while a Windows 10 in-place upgrade brings all the good stuff with it, it also transfers the baggage. Registry issues or erratic behavior will carry over from the previous OS. Finally, when performing an in-place upgrade, the user is locked into the architecture and edition he had previously. A clean installation is essentially a fresh start. It resets everything, and no issues from the previous OS carry over. This means more work for IT and more of an adjustment for users who lose their personal data and settings. On the IT side, it means reinstalling the apps users work with and working with bootable media that contains the Windows 10 installer. Whether IT picks a Windows 10 in-place upgrade or a clean install, it is critical to create a good backup of the old OS and data before making the move because things can easily go wrong. Do you prefer the in-place upgrade or a fresh installation of Windows 10?